Greetings, and welcome to the Woodhaven History Digest for September 2017! Click here if you are having trouble viewing this email! We hope everyone had a nice summer and is ready to have some historical fun! We kept busy over the summer. We had several cemetery cleanups and kept Woodhaven's historic burial ground looking sharp (top left); thanks to the generosity of the Josephine Foundation and the Friends of Maple Grove, a large group from Woodhaven attended a fun musical (top right); we had a nice walking tour of the old Union Course Racetrack (bottom left) and we had an Elvis Blue Hawaii Party (bottom right). Tuesdays at the Avenue Diner - The Woodhaven Cultural & Historical Society meets on the 1st Tuesday Night of every month at 7 p.m. at the Avenue Diner (91-06 Jamaica Avenue). The next meeting will be Tuesday, September 5th. This month we will take a look at some real interesting pictures we acquired; we will also look back at the history of St. Anthony's Hospital; and we will give a sneak preview of the Museum of Woodhaven History. Cemetery Restoration - We'll be at the Wyckoff-Snedeker Cemetery on Saturday September 9th from 11 a.m. to 2 p.m. The grounds are in good shape, but we could use some help raking up old leaves around the edges. Come out and be a part of a historical green project. Wednesday Lecture Series at Emanuel - We are resuming our weekday meetings this month on Wednesday September 27th at 1 p.m. at Emanuel United Church of Christ (91st Avenue and Woodhaven Boulevard). This month, we're going to have a fun Woodhaven Quiz Game! Richmond Hill Park Fair - The Richmond Hill Block Association will be hosting its 44th Annual Park Fair on Saturday, September 16th from 10 a.m. to 6 p.m. at Buddy Monument, located in Forest Park at the intersection of Myrtle Avenue and Park Lane South. There will be games, rides, vendors, food and fun! The Woodhaven Cultural & Historical Society will have a table at this event with a small sampling of our Museum of Woodhaven History. We will also be selling T-Shirts and Books to help support the organization. Woodhaven Lecture at Richmond Hill Historical Society - We are very honored to have been invited to give a presentation on Woodhaven's History at the Richmond Hill Historical Society on Friday September 29th at 7:30 p.m. at the Leonard Center (86-13 112th Street). Infamous Crime Scenes in New York City - WCHS Board Member (and Woodhaven resident) Ike Ilkiw will be giving a presentation about infamous crime scenes at Neir's Tavern on Saturday September 30th at 2 p.m. And the great news is that the presentation doubles as a fundraiser for the WCHS! Come out and enjoy a thrilling presentation (Ike is a great presenter and a storyteller) and help the WCHS! By the way, have you been watching American Ripper on the History Channel? 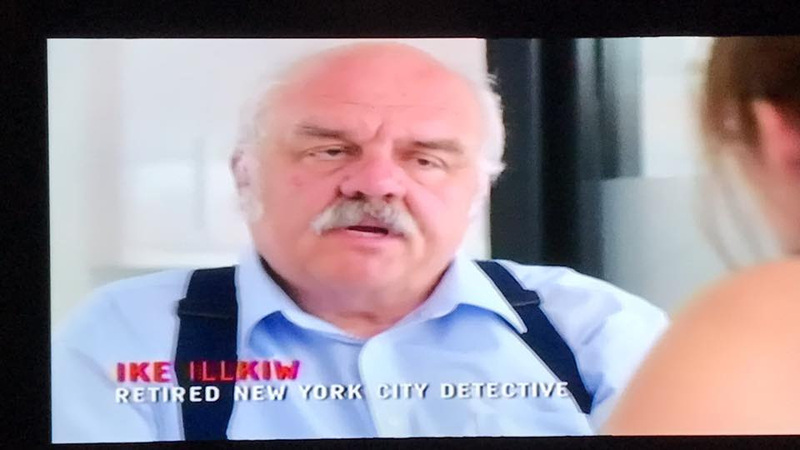 If so, Ike Ilkiw was interviewed about a NYC murder from 1891! Bonus: Click here to see Ike take about this infamous murder! Wonderful Woodhaven Street Fair - We'll have a table at the street fair which is Sunday October 1st from 12 noon to 6 p.m. (on Jamaica Avenue from Woodhaven Boulevard to 80th Street). Come visit us outside the office of the Woodhaven Residents' Block Association at 80-20 Jamaica Avenue. 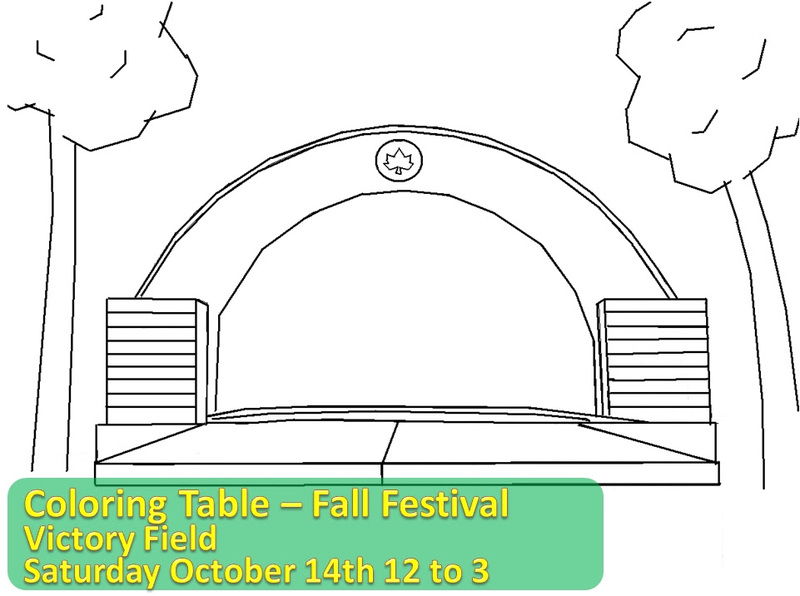 Fall Festival - This is a fun family event at Victory Field on Saturday October 14th from 12 p.m. to 3 p.m. Celebrate fall with this free event sponsored by CM Eric Ulrich with crafts, games, music, a great pumpkin patch (free pumpkins for kids), and more! The Woodhaven Cultural & Historical Society will have a special COLORING TABLE at this event where kids can use crayons to color drawings of Woodhaven History! 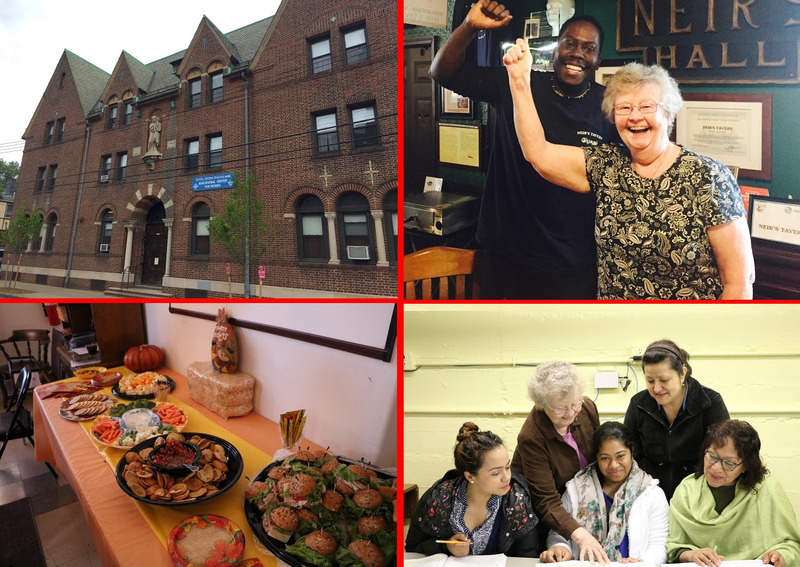 The School Sisters of Notre Dame Educational Center for Women is holding their annual Harvest of Wine and Cheese on Sunday, September 24th from 3 p.m. to 6 p.m. At this event they will be honoring Loycent Gordon, owner of Neir's Tavern and board member of the Woodhaven Cultural & Historical Society. Loy is being honored for his ongoing support of the center and for his support of the Woodhaven community. Everyone is encouraged to come out to this free event and tour the center at 87-04 88th Avenue and show appreciation for Loy Gordon. 2017 Woodhaven Dinner Dance - The Woodhaven Residents' Block Association is happy to announce the annual dinner dance will be held on Friday, October 6th from 7 p.m. through 11 p.m. at Roma View on Crossbay Blvd. This year's Man of the Year is familiar to WCHS Members, it is Walter Steffens, of Emanuel United Church of Christ. The WCHS is grateful to Walter for all of the help and assistance he has given us over the years and we are very happy for him. 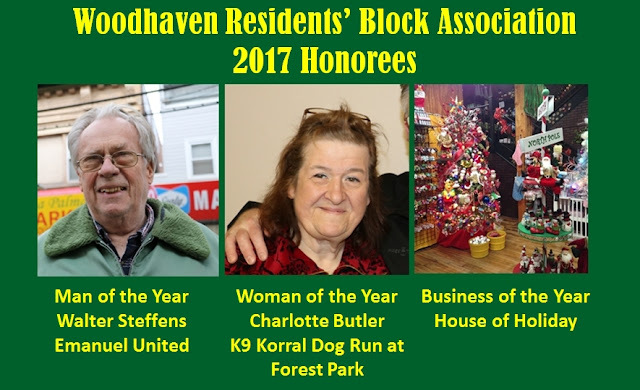 The other honorees are Charlotte Butler (Woman of the Year - President, K9 Korral Dog Run in Forest Park) and House of Holiday (Business of the Year). If you are interested in going, you can click here to purchase tickets. (We'd like all Historical Society members to sit together - make sure you add that notation when ordering tickets). Music at the Gate - There will be a free chamber music concert at St. Mary Gate of Heaven Church in Ozone Park (103-12 101st Avenue) Saturday September 9th at 7 p.m.
Queens Mystery Writers - The Friends of Maple Grove is sponsoring a free event celebrating the grand opening of the Kew & Willow Bookshop on Lefferts Blvd. Beloved Queens mystery writers Lyndsay Faye & Alex Segura will come to Maple Grove to discuss how Queens has influenced their writing and how they have woven their tales of mystery. RSVP by clicking here! Free admission; handicap accessible, Light refreshments will be served. Thursday September 14th 7 p.m. to 9 p.m. Free parking on cemetery grounds - enter at 129th St. & Kew Gardens Rd. Kew Gardens Community Arts Day - Sunday September 17th from 11 a.m. to 5 p.m. (Rain date Sunday October 1st). Outdoor arts fair on the streets of Kew Gardens (Lefferts Blvd, Austin Street & neighboring streets). Sidewalk chalk artists, Art demonstrations, Arts & Crafts Zone, Local Live Music! For more info, call 917-881-3358 or email kewgardensarts@gmail.com. Note: Artist Madeline Lovallo, famous for several Woodhaven paintings, will be at this event. 9/9/17 Saturday 10 a.m. - 11:30 a.m. Free Group Conversation on 9/11 National Day of Service & Remembrance. Explore how New Yorkers and people everywhere were transformed and interconnected in the aftermath of 9/11. Venue: Victorian Admin Building. Advance registration required ~ limited seating. Sponsored by Humanities NYC. 9/17/17 Sunday 1 p.m. - 2:30 p.m. Walking Tour featuring the Great Women of Maple Grove. Led by certified NYC Tour Guide and FMG Board Member Jo-Anne Raskin. $5 Fee (exact cash please). Meet at the Victorian Admin Building. RSVP requested. 9/23/17 Saturday 2 p.m. - 4:30 p.m. Spirits Alive. Annual outdoor event with presentation of historical figures at Maple Grove in the Victorian Monument Park section. Free admission. No RSVP needed. 9/24/17 Sunday 1 p.m. - 2:30 p.m. Walking Tour featuring the Great Men of Maple Grove. Led by certified NYC Tour Guide and FMG Board Member Jo-Anne Raskin. $5 Fee (exact cash please). Meet at the Victorian Admin Building. 10/1/17 Sunday 1:30 p.m. - 4:00 p.m. Fused Glass Jewelry Workshop with Naomi. Create glass jewelry designed with etching stencils! Victorian Admin Building. $25/$20 members. Advance registration required ~ limited seating. We are in the early stages of collecting and recording Oral Histories of Woodhaven residents past and present. The idea is that 100 years from now, future historians will be able to hear about the early days of our community in the voices of the people who lived it. We will be making these recordings publicly available - and also donating them to the Queens Library for permanent storage (as part of their Queens Memory project). If you are interested in participating (and we know you are), get in touch with us. And to help you get the memory juices flowing, we have created this worksheet. You don't have to put any answers in writing - this worksheet is just to help you think a bit about what you want to talk about before we meet. And interviews are conducted over the phone, so it's very easy and convenient! Woodhaven's TB Hospital - Click here to read about St. Anthony's Hospital, the hospital started by the Franciscan Sisters of the Poor to combat tuberculosis. Below, some members of the Woodhaven Cultural & Historical Society tour St. Anthony's before it closed and was demolished. Come out Tuesday, September 5th at the Avenue Diner for more on St. Anthony's. The Art of Stephen Csoka - We were happy to attend the opening of a retrospective of the art of artist Stephen Csoka, who lived on 87th Street in Woodhaven for several decades. Click here to read about Mr. Csoka, and his life. Remembering Anniversary Day - One of the more fondly remembered annual traditions in Woodhaven. Click here to read more about it. That's it for now - but we will leave you with one last thought.... we are currently working on The Museum of Woodhaven History *and* a brand new Woodhaven History Book. If you have any interesting photos squirreled away that you think would be of interest to either project, please get in touch with us! In the meantime, click here for a little teaser video we produced about the Museum! BlogTalkRadio - Live Every Friday Night at 10 PM - Returns in September! Greetings, and welcome the Summer Edition of the Woodhaven History Digest. Click here if you are having trouble viewing this email! We're going to start by thanking everyone who came out to our big party / fundraiser at the Forest Park Carousel. 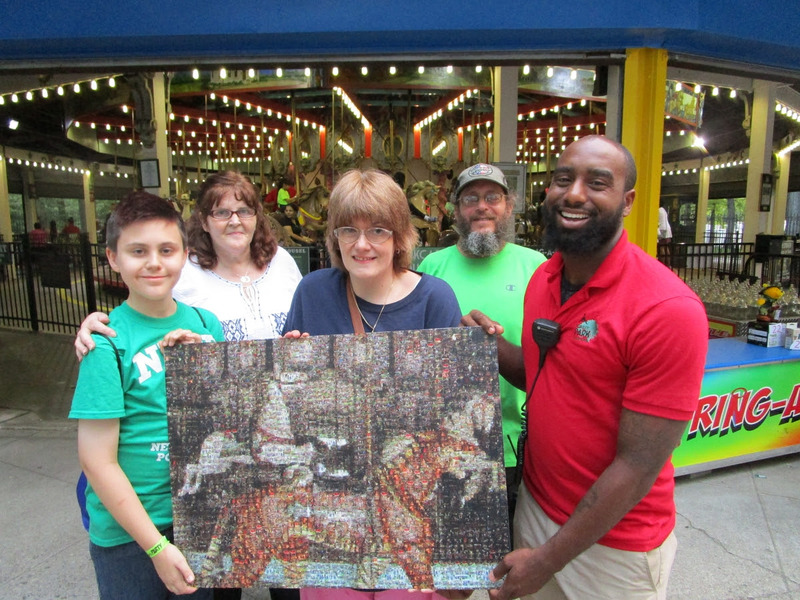 To thank the Forest Park Carousel for their generosity, the Woodhaven Cultural & Historical Society presented the Carousel with a mosaic that we created, a picture of the Forest Park Carousel made up from three thousand smaller pictures of the carousel! This was printed on metal, so it will hopefully last a long time - you can see it hanging inside the snack bar at the Forest Park Carousel! If you have not visited the Carousel this year, check it out! It's growing every year - check out their website. PS Did you hear that a wedding was held there last week? We heard it was a beautiful event - we'll share pictures as soon as they are posted! But it goes to show that our Carousel can be suitable for any number of occasions! The Woodhaven Cultural & Historical Society will be quiet this summer - we do not meet in July or August. But we will be back to our regular schedule come September - the 1st Tuesday Night of every month at 7 p.m. at the Avenue Diner (91-06 Jamaica Avenue) and the last Wednesday of every month at 1 p.m. at Emanuel United Church of Christ (91st Avenue and Woodhaven Boulevard). Our next cleanup has been rescheduled to Saturday, August 19th, from 11 a.m. to 2 p.m. We are going to continue working on the perimeter of the cemetery and could use a few extra hands raking and lifting up old leaves. Come out and be a part of the most interesting ongoing Woodhaven Historical project there is. Besides that, we have 2 fun FREE events scheduled for this summer, being announced here for the very first time - SAVE THE DATES. 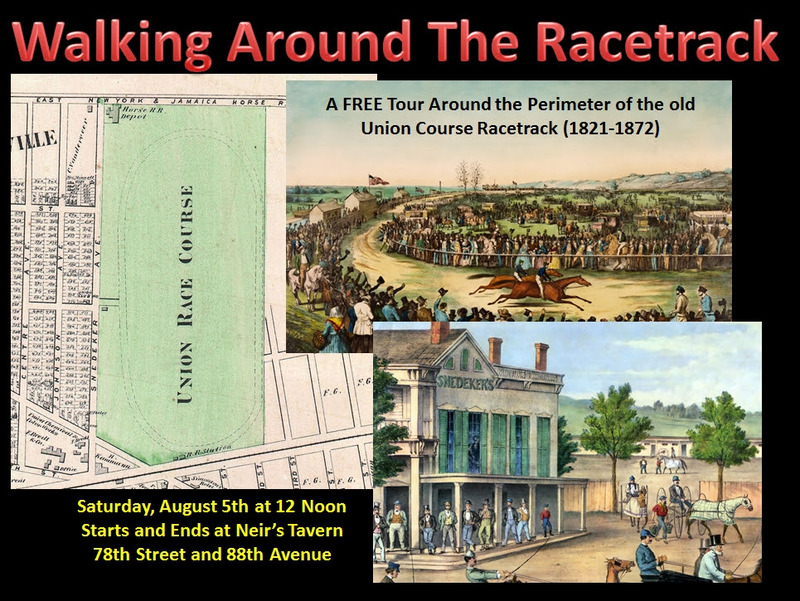 Union Course Racetrack Walking Tour - On Saturday August 5th at 12 Noon, the Woodhaven Cultural & Historical Society will give as FREE walking tour around the perimeter of the old Union Course Racetrack. Come walk in the streets of old Unionville as we show you the old hotels and other notable locations in and around the footprint of the old famous racetrack. Come see the last remaining traces of the old Union Course racetrack, still in existence today! Distance - 1.5 to 1.75 miles. The tour starts and ends at Neir's Tavern (87-48 78th St, Woodhaven, NY 11421) and will not only cover the history of the racetrack, but will cover other historic and notable locations from the 20th Century. Woodhaven's Blue Hawaii Party - It was 40 years ago this month that we lost The King. 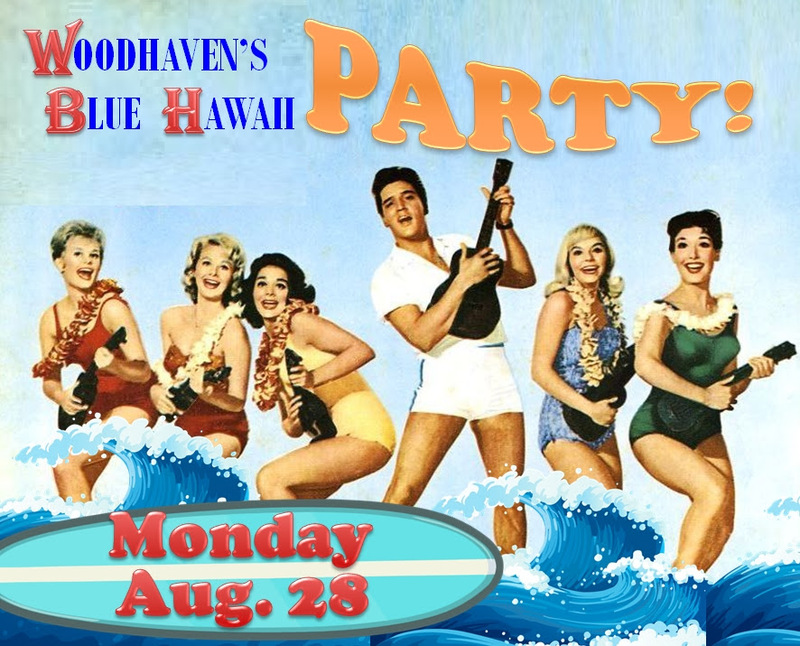 To mark this occasion we are hosting a Woodhaven Blue Hawaii Party - Monday, August 28th - with classic Rock and Roll Music, Trivia, and a showing of the Elvis Classic on our BIG SCREEN. We'll have a snack bar with hot dogs and popcorn. Dress up in your finest Elvis or Hawaiian Shirts for a chance at the Best Dressed Prize! Leis will be given to everyone. This party will take place at the Beach on the 2nd Floor of Emanuel United Church of Christ at the corner of 91st Avenue and Woodhaven Boulevard. Doors open at 6 p.m., the movie starts around 7:30 p.m. Attendance is FREE. A Sampling of Local Summer Events! St. Thomas the Apostle Rummage Sale - The St. Thomas Rummage Sale will be open on Saturday and Sunday the next two weekends (July 15 and 16 and July 22 and 23) from 10 a.m. through 4 p.m.And if you would like to donate used items to the sale, you can drop them off Monday through Thursday (10 a.m. to 3 p.m. and 6 to 8 p.m.) They will not be taking any donations after July 20. Click here to read more about this annual event in Woodhaven. Free Historical Documentary - The Forest Park Jewish Center is hosting a showing of Altalena, a documentary that examines the 1948 episode of the Altalena, a ship whose fate nearly incited civil war in the newly-established State of Israel. Sunday, July 16th, at 1:00PM at 90-45 Myrtle Avenue, Glendale (across from Victory Field). Beauty and the Beast - Movie Night at Grover Cleveland Park in Ridgewood on Saturday, July 15th. The movie starts at 8:30 pm. The Play Mobile will also be at the park between 11 am and 5 pm. Click here for more information. Meet the Animals of the Alley Pond Environmental Center - Saturday, July 15th 2 p.m. until 3:30. Join this free workshop and meet various animals from APEC. Learn about their habitats and how they live in nature - hands on activities! Located at Maple Grove Cemetery (127-15 Kew Gardens Road, Kew Gardens, NY 11415) by the Maple Grove Pond. In case of inclement weather the workshop will move inside the Center. Free parking and handicapped accessible. For more information please call (347) 878 6614. Outdoor Movie Nights at All Saint's Woodhaven - All Saint's Church (96th Street and 86th Avenue) has a nice schedule of outdoor movies for the summer. Please note that these movies are rain or shine - if the weather is bad, the movie will be moved into the Parish Hall. Food and refreshments are served at these film events. The schedule is as follows: July 25th - Moana, August 1st - The Chronicles of Narnia: Prince Caspian, August 15th - Finding Dory, August 29th - High School Musical. All films begin at approximately 8 pm (as soon as it is dark enough to see the film). Call (718) 849-2352 for more information. Annual Blood Drive at Emanuel United - The 11th Annual Warren Ackermann Memorial Blood Drive will be held on Saturday, July 22nd from 9 a.m. until 2:45 p.m. at Emanuel (91st Avenue and Woodhaven Boulevard). To make an appointment, please contact Dolores Rosato at 718-847-1694. Richmond Hill Book Sale - The Church of the Resurrection (85-09 118th Street) will be hosting a book sale (plus DVDs, VCR Tapes and more) on Saturday July 29th from 9:30 a.m. to 3:30 p.m. Call 718-847-2649 for more information. Free Queens Symphony Outdoor Concert - The 19th Annual Great Lawn Summer Concert (A Midsummer’s Enchanted Evening) featuring the Queens Symphony Orchestra, will take place Wednesday, August 2, at 7 p.m. St. John’s University, Great Lawn FREE Admission and Parking. Enjoy an evening of enchanting arias and songs plus the lush and romantic Symphony No. 5 by Tchaikovsky. For more information, please contact the Office of Community Relations at 718-990-5892 or communityrelations@stjohns.edu. Maple Grove Film Debut - The Friends of Maple Grove Cemetery are premiering a documentary by Utsab Giri, (Life, Death & Maple Grove) on Saturday, August 5 at the Kew Gardens Cinema. It is in the time slot from 1 to 3 PM (Block 1, Shorts featuring Kew Gardens and NYC). Click here for more info. Join the Friends of Maple Grove Cemetery at the Festival on opening night at Austin Ale House! Women's Self-Defense Class - There is a self-defense class for women scheduled for Saturday, August 26th from Noon until 3 p.m. sponsored by Grace Baptist Church. The class will take place in the upstairs hall at Emanuel (91st Avenue and Woodhaven Boulevard). Call (646) 208-1651 if you have questions. 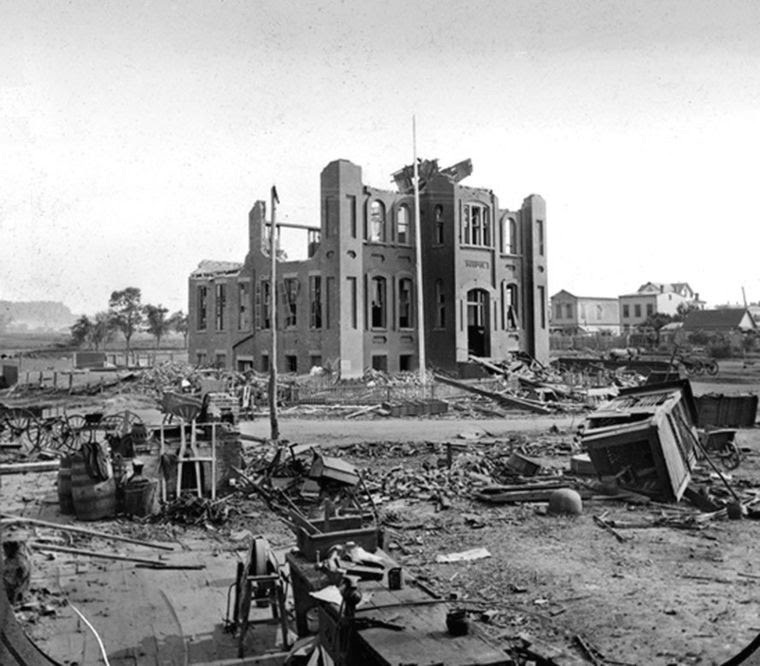 Woodhaven's Deadly Storm - 122 Years Ago Today - Click here to read about the destructive storm that hit Woodhaven on July 13th, 1895, destroying property, demolishing a school and killing 2 residents. Greetings, and welcome the Woodhaven History Digest for May 2017. We're starting off with a reminder that we have a very special event TOMORROW - Tuesday, May 2nd, starting at 7 p.m. at the Avenue Diner (91-06 Jamaica Avenue). The 1st Annual Woodhaven Quiz-O-Rama will let you show off your knowledge of Woodhaven History and Trivia! People will be grouped together in teams, and we'll be using game-buzzers -- and the main goal is to HAVE FUN. We hope you'll come out and join us -- but if you need more convincing, here's a fun little commercial we produced for the event - click here to see how many of these questions you can answer! Forest Park Memorial Drive - As requested by the Woodhaven Cultural & Historical Society (WCHS) and American Legion Post 118, and thanks to a bill submitted by CM Elizabeth Crowley (which passed unanimously), Forest Park Drive be rededicated as Forest Park Memorial Drive in a ceremony at Oak Ridge on Saturday, May 20th starting at 12 Noon. It was almost 98 years ago to the very day that these young men were honored by our community at this very spot -- it's really special that we'll be coming together again to honor their lives and their sacrifices and we hope you will be able to make it. As soon as we have more details on the ceremony, we will send out a special e-mail. Many thanks to everyone who supported this proposal (click here to read the letters of support for this request). Bonus: Click here to read about it in the Queens Chronicle! 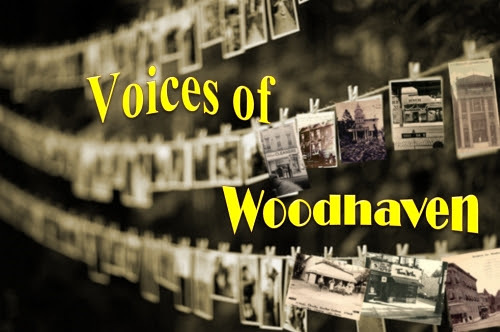 Voices of Woodhaven - We are in the early stages of collecting and recording Oral Histories of Woodhaven residents past and present. The idea is that 100 years from now, future historians will be able to hear about the early days of our community in the voices of the people who lived it. We will be making these recordings publicly available - and also donating them to the Queens Library for permanent storage (as part of their Queens Memory project). If you are interested in participating (and we know you are), get in touch with us. And to help you get the memory juices flowing, we have created this worksheet. You don't have to put any answers in writing - this worksheet is just to help you think a bit about what you want to talk about before we meet. And interviews are conducted over the phone, so it's very easy and convenient! The WCHS celebrated Earth Day at the famous Wyckoff-Snedicker Woodhaven Founders Cemetery behind beautiful All Saint's Episcopal Church (96th Street and 86th Avenue), and we had a great time planting flowers, planting grass and received a lesson about composting from St. Thomas the Apostle's Patty Eggers. Click here for lots of pictures of the cemetery plus a nice video showing you highlights of the month of April! Richmond Hill Historical Society - This month, the RHHS will meet on a Saturday (May 13th at 1:30 p.m) at the Leonard Center. The guest speaker will be James Greller and he will give a presentation called "Ridgewood/Glendale/Richmond Hill Before the Automobile." Some of you may remember Mr. Greller, he came to the Woodhaven Historical to speak about railroads and trolleys in Queens and he was very well-received! Woodhaven Cemetery Cleanup - The monthly cleanup of the Wyckoff-Snedicker will take place on Saturday, May 13th. Please note that we are experimenting with a later start time -- the cleanup will start at 11 a.m. We are in need of volunteers to do some light cleanup work - some raking, picking up twigs, etc. And the gates (at 96th Street and 86th Ave) will be open until 2 p.m. for everyone who would like to come and visit this Colonial Era cemetery right in our backyard! Come out and we'll even hook you up with one of our tour guides! Barry Lewis on Coney Island - Architect and Historian Barry Lewis will be giving a free lecture on Coney Island at the Kew Gardens Community Center (80-02 Kew Gardens Road, Suite 202) on Thursday, May 18th starting at 7:45. This presentation is sponsored by the Kew Gardens Council for Recreation and the Arts and they advise that seating is limited that that you will need to bring ID for building admittance. Emanuel's 140th Anniversary Party - The WCHS holds a lot of their events at Emanuel United Church of Christ, and we are happy to announce that they are celebrating their 140th Anniversary with an old fashioned pasta party - with old fashioned prices! For just $5 you get a spaghetti supper with bread, dessert and beverage all included! Saturday, May 20th at 5 p.m. Click here for more info and stay tuned for even more details. We'll be making a very special presentation to Emanuel - you won't want to miss it! Reserve your seats now - 718-849-1153! Memorial Day Ceremonies - Memorial Day is Monday, May 29th. The GWDC/WBID will be holding their annual ceremony on the evening of Thursday, May 25th at Forest Parkway. And American Legion Post 118 will be holding their annual ceremony at their headquarters (89-02 91st Street) on Memorial Day morning. As soon as we have the exact times we will pass them along. 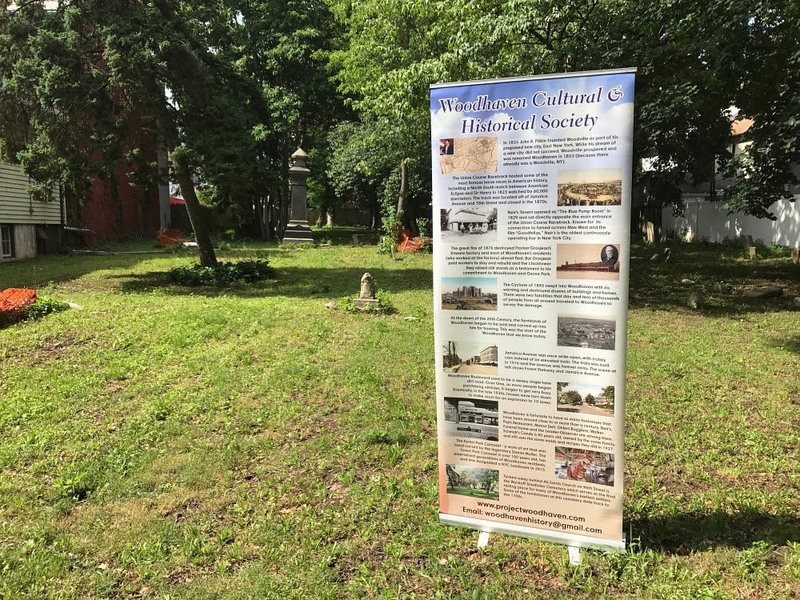 Woodhaven Wednesday Historical Lecture Series - Our next free daytime lecture will take place at 1 p.m. on Wednesday, May 31st at Emanuel United Church of Christ (91st Avenue and Woodhaven Boulevard). Our lecture this month will be delivered by June McCowan, longtime member of the WCHS, and she will be giving a lecture on some of her historic relatives, details to follow soon. Dedication of Pine Grove Trees in Forest Park - Recently, 100 new trees were planted at the Pine Grove in Forest Park in Richmond Hill. There will be a dedication ceremony on Friday June 2nd at 11 a.m. at the Buddy Monument. This is right near where the Richmond Hill Memorial Trees were planted! Woodhaven Historical Party at the Carousel - Save the Date!! Our big event of 2017, our party at the Forest Park Carousel! Friday, June 23nd from 6 p.m. to 8:30 p.m., $10 gets you unlimited rides on our NYC Landmarked Carousel and the Woodhaven Express Train Ride! A great bargain, and all proceeds go to the WCHS - many thanks to the Forest Park Carousel for their generosity! Citizen's Committee 2017 Award - We are very proud to announce that the Woodhaven Cultural & Historical Society has won a grant from the Citizen's Committee for New York City for the 3rd consecutive year! The 2015 grant went towards the cemetery; and the 2016 grant went towards the production of a history booklet for young students who volunteer at the cemetery (click here to read about it); the 2017 grant will be going towards the Museum of Woodhaven History! WCHS Raises $400 for Kids With Special Needs - Many thanks to all of the donors and hard workers at the cemetery that came together and raised $400 for WORKS Little League's Challenger Division. 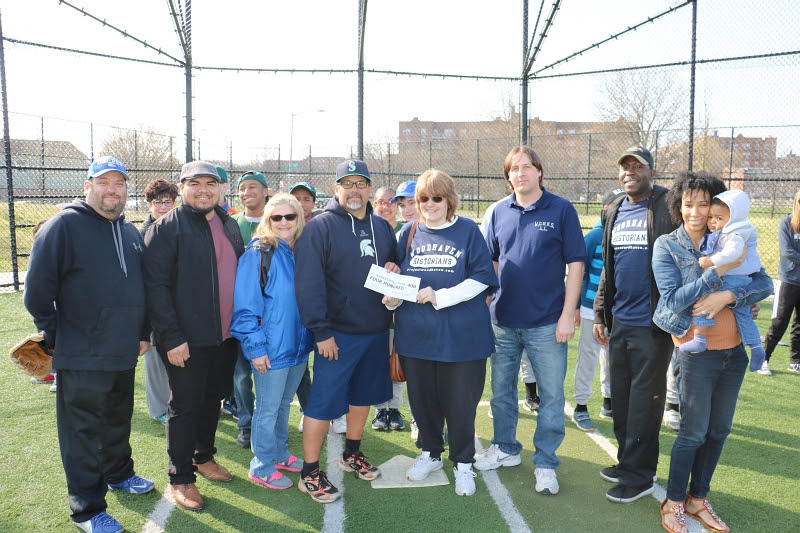 We recently visited the ball field on opening day and presented them with a check (click here to read more about it). Neir's Tavern in the NY Daily News - Did you see the article about Neir's in this week's Sunday Daily News (in the Queens section). It's not online yet, but thanks to Jim Beck for sending us a photo (click here to see it). Woodhaven's NYC Tour Guide - Woodhaven's Ike Ilkiw is the founder of New York City Adventure Tours, which offers such tours as the “Law and Order Walking Tour (Cops and Robbers) of Lower Manhattan,” the “Twin Bridges Walking Tour” (which takes you over the Brooklyn and Manhattan Bridges by foot), and “Crime and Vice in New York’s Old Five Points,” in addition to a tour of Green-Wood Cemetery. Click here to visit New York City Adventure Tours, and click here to read more about Ike in an article we wrote in the Leader-Observer before he gave a great presentation at one of our meetings. From the Rumor Mill: We hear that Ike (a former NYPD Detective) will be giving his Infamous NYC Murders presentation pretty soon at a famous local watering hole - we'll pass along details as soon as we can confirm! 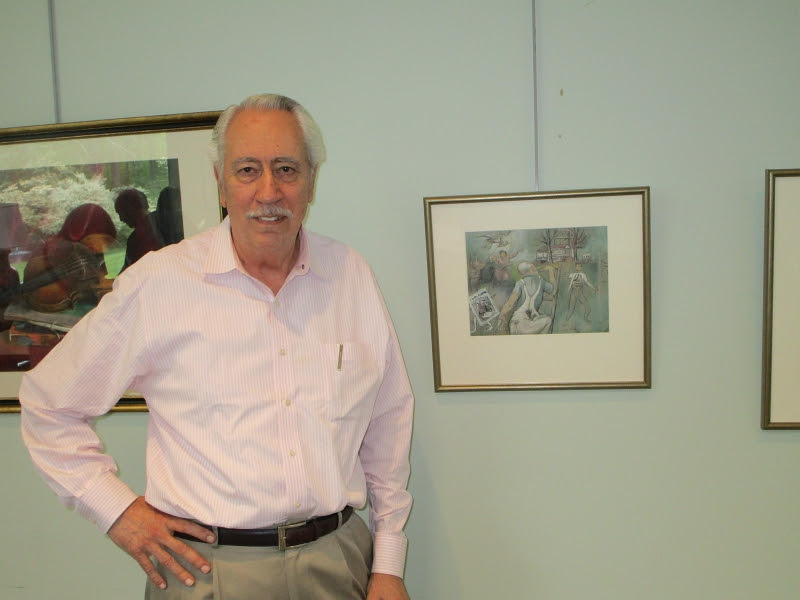 Famed Woodhaven Artist Exhibit Opens - Here's a real Woodhaven treat out on Long Island -- an exhibit of artwork by Stephen Csoka, who lived on 87th Street for nearly 3 decades. The artist's son, Frank Csoka, was on hand today's well-attended grand opening, where we took the above photo. You'll be able to see the life of the artist and his family depicted in "Marital Milestones," small paintings the artist created for his wife Margaret on each wedding anniversary (there are more than 50 in all). The exhibit will be open through Tuesday, June 6th at the Shelter Rock Art Gallery at the Unitarian Universalist Congregation at Shelter Rock (48 Shelter Rock Road in Manhasset, NY 11030). Since the art gallery is a multi-purpose room, call ahead to ensure it will be open 516-472-2933. Make sure you grab one of the handouts to read along as you go through the exhibit -- and keep your eye out for the one where the family makes the move to Woodhaven!! Bonus #1: Click here to read our article in last week's Leader-Observer! Bonus #2: Click here to HEAR our interview with Frank Csoka. Richmond Hill Seeks Historic District - The Richmond Hill Historical Society is looking to preserve their community's many beautiful structures by applying to have a large area designated as a Historic District. There is an online petition you can sign to show your support (click here). Bonus: Click here to listen to our discussion on this with RHHS Vice President Helen Day. Here are some headlines from the Leader-Observer, May, 1917 -- 100 years ago! 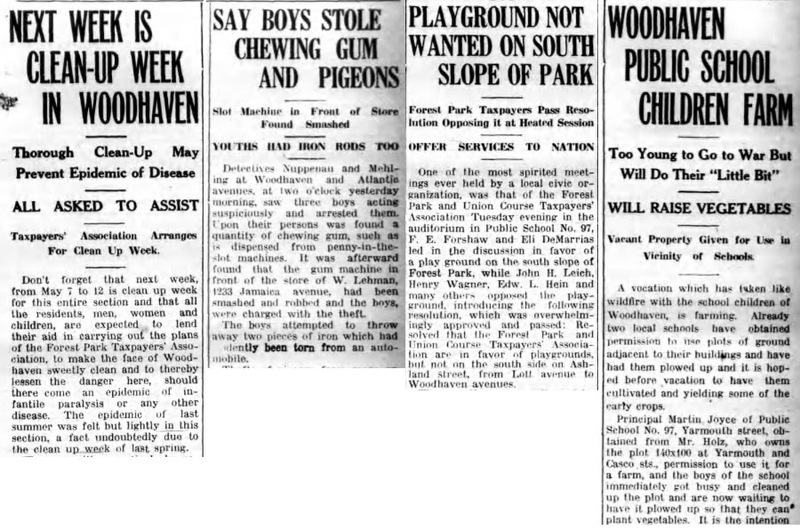 They were planning a cleanup of Woodhaven to protect residents against diseases such as infantile paralysis. Some young boys smashed a penny-candy machine and made off with chewing gum! One of the controversies of the day was the creation of a new playground (the one we know today as Mary Whalen Playground). And 100 years ago there was enough empty ground around PS 97 that students were using it to farm vegetables! 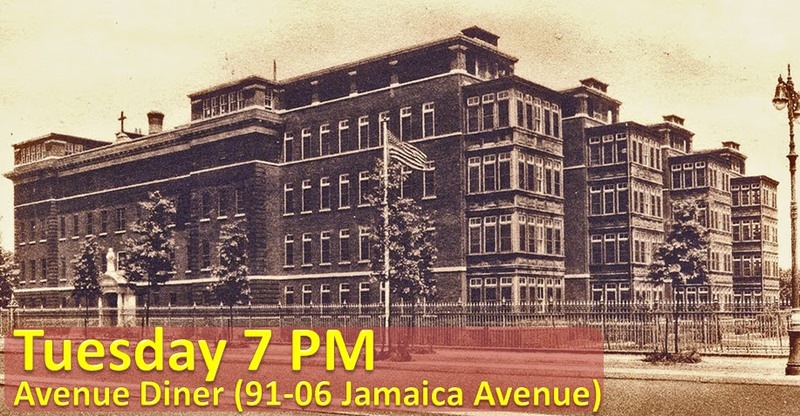 Come out to our monthly meeting of the Woodhaven Historians (7 p.m. on the 1st Tuesday of every month at the Avenue Diner, 91-06 Jamaica Avenue) to find out more about your community's past! A Woodhaven Christmas Miracle - This month, we will honor the sacrifices made by young men who died in World War 1 (and a tree was planted in each of their names along Forest Park Memorial Drive). There was one young man who was almost one of those lost in that war - and his story is a true Woodhaven Christmas Miracle. Click here to read all about it! A Forgotten Woodhaven Pond - Here's an interesting story about a long-lost pond in Forest Park that many older Woodhaven residents remember well. Once we visited it, we began digging around and found out that it may have had a name - and was quite probably the location of a tragic accident 99 years ago this very month! Click here to read about Woodhaven's Crystal Lake! The project to turn the Woodhaven Cemetery into a beautiful green spot in the middle of Woodhaven kicks off Phase 2 this Saturday from 9 AM to 12 PM, behind All Saints Church (96th Street and 86th Avenue). The weather is beautiful - a great day to get out and get some exercise and we do some light spring cleaning. 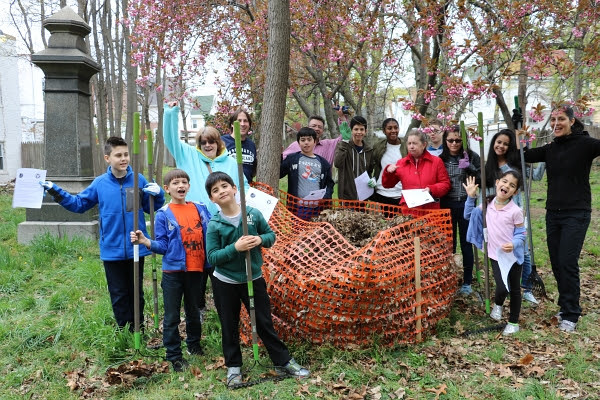 Over the past 2 years, volunteers from around Woodhaven took on the project of cleaning up the Wyckoff-Snedicker Cemetery behind All Saints Church on 96th Street. The cemetery goes back to the early 1700s, maybe earlier -- and contains members of the founding families of Woodhaven -- the Lotts, the Wyckoffs, the Snedickers, the Elderts, and more. The last burial was around the turn of the century and the cemetery has been the victim of neglect on and off over the past century. The Woodhaven Cultural & Historical Society, partnered up with the students of St. Thomas the Apostle's Woodhaven History Club and we were joined by volunteers from around the community and other organizations such as Boy Scout Troop 139 of Howard Beach. Together we began slowly turning an eyesore into an eye opener. Here is a video of the progress we've made so far - look at the happy faces on our team - come out and be a part of that! 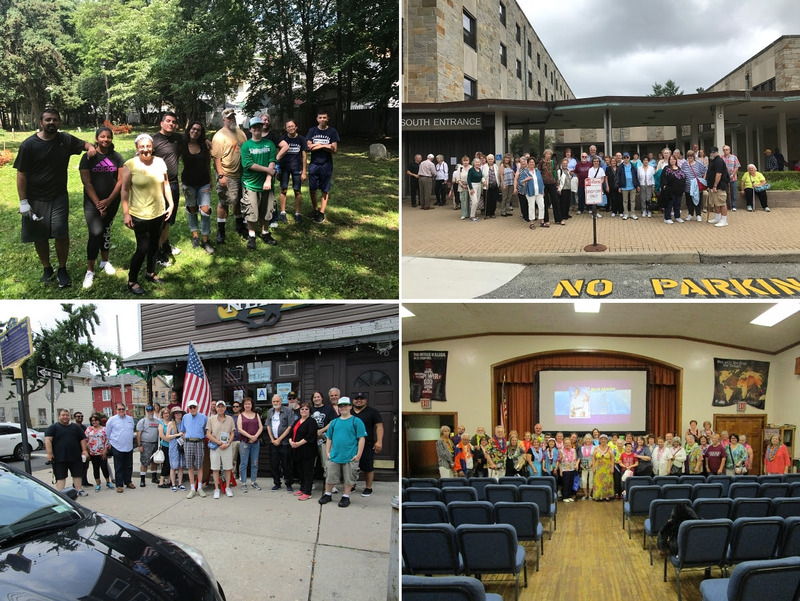 Think of it like a monthly exercise event - where you get to hang out with your neighbors in the sunshine - in one of the most historical places in Woodhaven. Come out and be a part of a special project that is turning something that's been hidden away into something all residents of Woodhaven will be proud of. Remember the good times you spent at the Drive-In back in the good old days? The excitement of Coming Attractions and Short Films -- the great music on the speakers -- running to the Snack Bar to get Popcorn or Hot Dogs -- those were great times. The Woodhaven Cultural & Historical Society is looking to bring back the flavor of those good old days with a Drive-In Party on Saturday, August 22nd from 6 to 9 PM (doors open at 5:30 PM) at Emanuel United Church of Christ (91st Avenue and Woodhaven Boulevard). Admission is $5 for Adults and $2 for Children. Bring blankets for the kiddies to sit on, if you'd like! All proceeds will go to support the Woodhaven Cultural & Historical Society. Also, be sure to visit our TIME WARP BOOTH ... where Woodhavenites mingle with Space Aliens, Dinosaurs, King Kong -- anyplace you want to go! By August, we can expect some hot temps -- so we're grateful to be indoors, air-conditioned and bug-free! Also - we'll have a few miniature cars for the kids to sit in and pose for pictures at our Drive-In! All proceeds go to the Woodhaven Cultural & Historical Society to fund several projects including the decoration of the Memorial Trees in Forest Park and the ongoing restoration of the Wyckoff-Snedicker Cemetery on 96th Street. And don't forget to visit the Snack Bar -- You! Yum! Come out and spend a summer night with your friends and neighbors at the Drive-In Party on Saturday, August 22nd from 6 to 9 PM (doors open at 5:30 PM) at Emanuel United Church of Christ (91st Avenue and Woodhaven Boulevard). Veteran appraiser Eddie Costello will return to the Woodhaven Cultural & Historical Society on Wednesday, November 12th at 1 PM at Emanuel United Church of Christ, at the corner of Woodhaven Boulevard and 91st Avenue. All members of the WCHS are guaranteed one free appraisal. After all of the members have gotten an appraisal, everyone -- members & non-members -- will have their names pulled from a hat and get an appraisal for one item as long as time permits. Even if you don't bring an item to get appraised, it's fun to see the interesting things people bring -- and you'll have a great view. What we do is position a camera real close and project it on a large screen, giving you a front-row seat! We hope to se you next week! 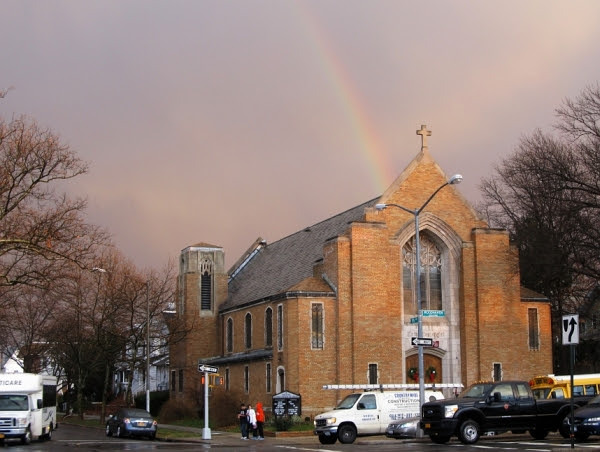 There will be a community cleanup effort at a historic location on Saturday, July 12th when people come together to clean up the Wyckoff-Snedicker Family Cemetery behind All Saint's (formerly St. Matt's) on 96th Street in Woodhaven. This cleanup is sponsored by the Woodhaven Cultural & Historical Society in partnership with the St. Thomas the Apostle Woodhaven History Club. Students from all schools are very welcome - as is anyone else. The famous cemetery, located behind the church at 85-45 96th St., needs to have weeds pulled, brush cleared away, etc. We will meet at 9 AM. Lunch will be provided to everyone who takes part in the clean up. We will be borrowing rakes and other tools - but you will need to bring your own work gloves. If you want to sign up for the clean up, please email us at projectwoodhaven@gmail.com. The Wyckoff-Snedicker Family Cemetery goes back to the colonial era and has been profiled here and more recently here. The film will be premiered on Monday, June 10th at 6 PM at the Cinemart Movie Theater - on Metropolitan Avenue in Forest Hills. The filmmakers have done their due diligence and we are very excited to see what they come up with. There are a number of other interviews on tap -- with a number of surprises mixed in with a number of very familiar names and places. St. Thomas the Apostle has a very accomplished video program - click here to view their very active You Tube Channel. Booster - For $25.00 you will get 2 tickets to the premiere and your name listed as a Project Booster in the special program that will be handed out to all theatergoers (and published on Project Woodhaven). Sponsor - For $50.00 you will get 2 tickets to the premiere. Your name (or business name) will be listed in the special program as a Sponsor, and you can add up to 3 lines of text beneath your name. Advertise your business or just pass along a greeting to the residents of Woodhaven! Your name (or business name) will also be displayed in a list of sponsors on the big screen during the pre-movie slide show of old images of Woodhaven. Gold Sponsor - For $75.00 you will get 2 tickets to the premiere. Your name will be listed in the special program as a Gold Sponsor, and you can add up to 4 lines of text beneath your name, which will appear in a box by itself. And during the pre-movie slide show of old images of Woodhaven, you will get an entire slide to yourself. Plaster a giant sized photo of you, your family, your business -- whatever you want -- up on the silver screen! Platinum Sponsor - Anyone that donates the maximum, $125.00, will get 2 tickets to the premiere and all of the same goodies that the Gold Sponsor gets. But you will also get 2 free tickets to a pre-film (5 PM to 6 PM) courtesy buffet of Panini sandwiches, wraps, pizzas, salads, spinach pies, juices, coffees, teas, cappuccinos, café lattes, smoothies, and hot chocolate. Be sure to include your contact information so we can work with you on the lines of text, the giant slides, etc. The deadline for becoming a sponsor is Wednesday, June 5th. Note: Seating for the premiere is limited so at this time we can only offer tickets to sponsors. Email projectwoodhaven@aol.com for more information.